Vitus Commentary: If I tell you I can fly enough times, you may start to believe it. But I still won't be able to fly. If I tell you I can fly enough times, you may start to believe it. But I still won't be able to fly. Indeed, the modern era of rapid economic growth commenced after both Democratic and Republican presidents undertook to lift costly and stultifying New Deal regulations. Beginning in the early 1980s, the developed world and some big players in the developing world experienced a period of extraordinary growth. ...these are pure fantasies on the part of the right. The true age of spectacular growth in the United States and other advanced economies was the generation after World War II, with post-Reagan growth nowhere near comparable. So why do these people imagine otherwise? And the answer, once you think about it, is obvious: growth for whom? 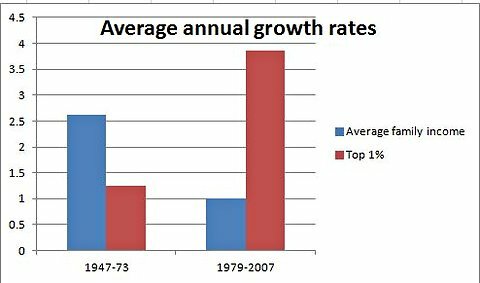 There’s only one way in which the post-deregulation boom was exceptional, and that’s in terms of the growth in incomes at the top of the scale.